He grew up in Anaheim Hills, Calif. and went to Canyon High School. In the fall of 2004, he beganÂ playing in wood-bat showcases and the summer after his junior year of high school he played for Team USA’s Junior National Team that also included Clayton Kershaw, Brett Anderson, Lars Anderson and Adrian Cardenas, among others. During his senior season, he was one of the top high school prospects in the countryÂ and Baseball America projected him to be a third-round pick in 2006. 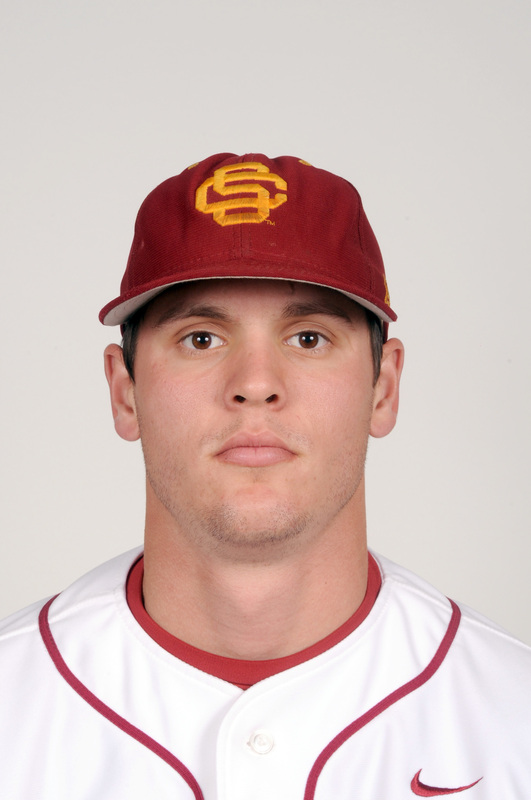 However, signability concerns caused him to slip and the Padres took a chance on him in the 14th round. He reportedly wanted $1.4 million to sign, which the Padres wouldn’t give him, so he headed to USC where he became the Trojans’ first true freshman to start at shortstop since Seth Davidson in 1998. The 6-foot-3, 180-pound Green didn’t disappoint. He started every game for the team and hit .316 while setting school record with 10 triples. He was a Louisville Slugger Freshman All-American, Pac-10 Co-Freshman of the YearÂ and was a second-team Fresh man All-American for Baseball America. He was invited to play in the Cape Cod League that summer and helped the Yarmouth-Dennis Red Sox win a championship by playing all four infieldÂ positions and hitting .291 with four home runs and 11 stolen bases. He ended up being ranked the 18th-best prospect in the league by Jim Callis at Baseball America. Green built upon his freshman season this year and improved in all facets. Last year as a sophomore, he hit .390/.438/.690 with 15 doubles, five triples and a team-leading nine home runs. His batting average ranked third in the Pac-10 last year, ahead of three first-round picks (Jason Castro, David Cooper and Ike Davis) and his slugging percentage ranked 10th, earning him third-team All-American honors from Baseball America. He doesn’t walk a lot, drawing just 15 free passes over 228 trips to the plate, but he doesn’tÂ strike out a lot ether, whiffing just 35 times.Â Green has above-average speed and stole 10 bases in 14 attempts. He headed back out to the Cape for the summer and put another exclamation point onto a stellar regular season. This time, Green played for the Chatham A’s where he hit .348/.451/.547 with 12 doubles, six home runs and 10 stolen bases. Green won CCBL All-Star game MVP honors after blasting a two-run home run, won the league’sÂ Robert A. McNeece Outstanding Pro Prospect Award and, this year, Callis named the number one Cape Cod prospect, drawing comparisons to Evan Longoria and Troy Tulowitzki. Scott Pickler, who coached Green on the Cape two years ago and coached against his team last year, was impressed with what he saw. Pickler is not alone with those beliefs. The coach agreed with Pickler, saying that Green has the range to stay at shortstop but added that, if he needs to move off the position, he has the bat and the arm strength to play third base. He won’t come cheaply, however. Like Strasburg, Green is advised by Scott Boras, but if he puts together an impressive junior season, he’ll be worth the price. Five-tool shortstops don’t grow on trees and there’s a part of me that believes Green could actually end up being better than Strasburg. Mark your calendars for May 1-3, as USC willÂ be in townÂ to play the Huskies. From what I’ve heard of them both, I suspect Strasburg has the higher plausible ceiling: it sounds likelier that a future Strasburg wins the Cy Young than it does that a future Green wins the MVP. That said, given the volatility of pitchers, it’s also a lot likelier that Strasburg flames out. Considering that Green’s ceiling is pretty good — from what I’m reading, he looks like a solid bet to be an all-star who contributes in every facet of the game, a good hitter who plays a good shortstop — well, given what prospects we have, what prospects we don’t, and what needs we have, at this point he sounds to me like the better fit for us. Of course, a lot could always change between now and next June . . . It should be interesting to see what Washington decides to do with their #1 and #10 picks. Will they decide to draft two lesser talents for signability, or draft a premium talent at #1 and a VERY signable player at #10, or throw caution to the wind and risk a repeat of 2007 and just draft the best players when they are on the clock? For once, our starting pitching shouldn’t be a problem with the youngsters already in the majors and by the development of Aumont, Pineda, etc. in the minors. But what do we have for position players coming up? With Yuni regressing so much, and nothing at 1B, except a guy in Lopez that doesn’t want to play there, we need to restock on the infielders. And this kid sounds so legit; he could make the bigs by 2011…maybe sooner. Great write up, Conor. I’ll look forward to the next installments. As good as Strasburg is, I don’t think there’s any question that the M’s need position players more than pitchers at the moment. If Strasburg is there he might be tough to pass up, but hopefully the M’s can find a star position player who will anchor the team for a decade, much like Chipper Jones has done for the Braves. That said, given the volatility of pitchers, itâ€™s also a lot likelier that Strasburg flames out. because of our need for shortstop and what I’ve read, I do like green. I did read though in a blog that he was a bit of a head case. I also really like 1st baseman Ackley. A lefty with a lot of power and a leader in the club house. (check him out on utube breaking his aluminium bat and still hitting it out). Is there any way we could make a trade with another club for 2 top 5 picks this draft? Of you could get both wow. He doesnâ€™t walk a lot, drawing just 15 free passes over 228 trips to the plate, but he doesnâ€™t strike out a lot ether, whiffing just 35 times. IOW, he’s already hitting like an M’s middle infielder. Boras is his agent, and he has college eligibility left. Arggh. The M’s should take the best player available, position be damned. SOS — truth; but risk factors in to “best player available,” and the risk is higher at P and C than other positions. Washburn’s money could have made picking up whoever the M’s want in the draft a lot easier signability wise. Like SOS, taking the best player available has always been a favorite of mine, position be damned. That’s not saying to ignore risk factors, but I’ve never bought into the theory of trying to project with any certainty what a team’s makeup is going to be like in 2-5 years. Take the best overall mixture of talent on the board and if you end up with a surplus of certain positions, so be it. Nice read. Post one on Dustin Ackley soon the CF/1B from I think out of NC he is supposedly the best hitter in the draft. The Mâ€™s should take the best player available, position be damned. Absolutely the right strategy. However, a lot can happen between now and the draft and price has to factor in as well. No matter what, I’m confident we’ll end up with a great talent. Excellent work Conor. Thanks for filling in with the great articles. I look forward to write ups on Dustin Ackley and Alex White as well. Even though this is all extremely early, and new names will definitely appear. Who could be available for our potential compensation picks later in the 1st round. Players like Ryan and Zach Wheeler, Beau Wright, Shelby Miller, and Ryan Ortiz are real possibilities. This is going be a draft that could definitely get this franchise back on track if approached correctly. This is very real concern. DrivelineMechanics did a nice job covering his motion in an article last month. When I watched footage of Strasburg from the Olympics I noticed the same backloading and became concerned that he was going to ruin his arm. However, as DLM notes 2-3 season of Strasburg before his arm flies off and smacks someone in the face still holds a tremendous amount of value. Who could be available for our potential compensation picks later in the 1st round. Players like Ryan and Zach Wheeler, Beau Wright, Shelby Miller, and Ryan Ortiz are real possibilities. This is going be a draft that could definitely get this franchise back on track if approached correctly. You must be thinking of some other sport. Baseball does not allow teams to trade or sell picks (they can’t even trade the player they picked until a year after the draft). Remember: baseball is not a free market. It’s a rather incompetently run cartel. Actually it would probably be more like 4 in the top 50 (but three in the top 30 and five in the top 70ish) But still…very exciting! I know that there’s a lot to be said for taking the best player on the board, position-be-damned, but aren’t we supposed to have a future all-star SS in Carlos Triunfel (insofar as anyone is a future all-star before they’ve ever played a game in the bigs)? I haven’t seen his name on this blog in awhile. Is there something that I don’t know about? Triunfel’s not likely a shortstop in the majors. Conor wrote a bit about Triunfel here on the 6th. Just type ‘Triunfel’ on the search too. I would really like for the Mariners to sign a hitter from college or high school who already exhibits some patience at the plate. Such players won’t start appearing on the M’s minor league rosters until the M’s start drafting them. So my enthusiasm about Green = meh. As I understand it, shortstop is typically the position of the most athletic player on the field. I would not be surprised to see a lot of good players at other positions (i.e. 3B, 2B, CF, LF) were shortstops when they were first drafted. No discussion of the Ms potential pick at #2 is complete without a consideration of the relief arms and DH prospects that will be available in that slot. TomC – this is true. A few players that were drafted as shortstops include Gary Sheffield, Jim Thome, Phil Nevin, Michael Cuddyer, Brian Roberts, Hank Blalock, Josh Willingham, Ian Kinsler, Adam Jones, B.J. Upton…Bo Jackson played SS in HS…the list goes on and on. If you’re familiar with the defensive spectrum, this makes a lot of sense. You can see that shortstops can essentially play anywhere on the field, whereas left fielders, can really only play left, first base or DH.